Since 2003, Basketball Hoops Online has helped thousands of customers find the right solutions to meet their basketball equipment needs. We offer a full line of Residential, Institutional, and Professional grade basketball equipment. We also offer, other popular Team Sports products, so please visit our website for more details. Our company is an Authorized Dealer with First Team, Inc. First Team is a proud manufacturer of American-Made products, with their own unique brand of sporting goods, for all levels of play. Our Customer Service philosophy is based on the same principles that First Team offers its dealers. It’s very rare in the business world to have a close working relationship with an owner of a big corporation. First Team owners are always readily available to talk to one of our BHO team members, to answer any questions that will provide valuable product support, for our customers. First Team is on our team and your team as well. Now some of our biggest customers are residential customers looking to upgrade or replace their current basketball system. We work closely with First Team, to find you the best basketball system that fits your needs and budget! If you don't need a complete basketball system, we also offer First Team, basketball supporting hardware and accessories, such as basketball backboards, backboard upgrade packages, and backboard extension arms. We also offer pole padding, edge padding, basketball rims and nets, bolt-down anchor kits, and a vast selection of replacement parts. Do you need professional installation services? 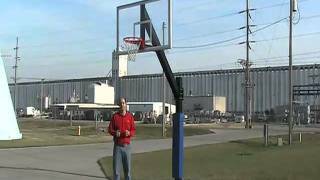 We can provide you with a full list of Basketball Hoop Installers at no charge. If you want to install your new basketball system yourself, you can view and even download product installation manuals from our website. Is your current sports equipment outdated? Do you need a price quote on a large or small project? We can outfit your indoor or outdoor sports court with high-quality, durable, First Team sports equipment. Our Sales Staff works directly with First Team to accurately select the right products, to meet your project’s needs. Our Goal is to get you the right Goal, at the best price, in a timely manner! First Team Product Categories! PREMIUM BASKETBALL EQUIPMENT: First Team makes a variety of basketball goals, including fixed, portable and wall-mounted options. We have basketball nets available in your choice of nylon, steel or chain. First Team makes basketball backboards from several types of materials, including tempered glass, acrylic, fiberglass and steel. VOLLEYBALL SPORTS EQUIPMENT: First Teams volleyball product line includes competition level volleyball systems, volleyball nets, volleyball judge’s stands and padding. First Team also offers portable volleyball poles designed for competition and recreational use. SOCCER EQUIPMENT: First Team soccer goals are manufactured with top quality performance and value in mind. Our wide selection of portable soccer goals, permanent soccer goals and semi-permanent soccer goals are available in both 4" square or round aluminum. FOOTBALL EQUIPMENT: Only First Team football equipment offers the ease of use, long term durability and performance you expect. Our huge selections of football goalposts are available in 4 1/2", 5 9/16" and 6 5/8" post diameters, along with optional adjustable crossbar features. LACROSSE GOALS: First Team lacrosse goals are all made with care by American workers using the best materials available. These goals are tough and durable but are designed with safety in mind and won't cost a fortune. TENNIS & PICKLEBALL EQUIPMENT: First Team manufactures tennis posts, pickleball posts, nets and accessories. If you are considering building a new tennis court or pickleball court, check out the variety of options we have available. BLEACHERS & BENCHES: We offer a wide selection of First Team bleachers and benches for crowd and player seating. All bleachers and benches are manufactured using aluminum seat and foot-planks supported by a powder coated steel under structure. Finally, If you didn’t see a particular basketball hoop or supporting accessory on our website, please free to contact us, and one of our Customer Service Representatives will assist you. From our website, you can review our Social Media apps, and find out what people saying on our Blogs, and you can also create your own Product Reviews on each of our product pages, you visit. 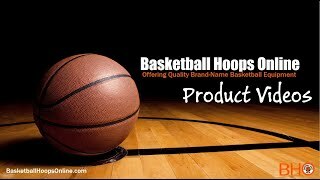 Remember, not all Basketball Hoop Dealers carry a Full-Line of Products like we do, so Basketball Hoops Online wants to become your One-Stop-Shop for all your basketball equipment needs! If you have any questions or comments about this video, please feel free to call us at 404 456-3817, or you can visit us on the web, at BasketballHoopsOnline.NET Thank you.